Unplugged vacations in Costa Rica – the dream of every stressed-out city dweller looking for an escape. It’s quite ironic when one thinks about it: just a few years ago, we’d all have paid extra for an eco-lodge in Costa Rica that offered Wi-Fi and, nowadays, we’re willing to pay more for one that doesn’t. It’s not all that surprising, really, considering so many people feel unable to switch off straight off the bat, to simply ignore the device even if connection is on offer. Digital detoxing is certainly rising in demand and although totally unplugged destinations are disappearing right before our eyes, a few choice options have remained steadfast in their aim to offer unrivaled, nature-infused, off-the-grid experiences in Costa Rica. If that sounds like something you’d love to experience, here are the best spots for your Costa Rica Unplugged Vacation – The Most Rewarding Remote Destinations to Visit. Over a dozen stunning lodges immersed in the pristine wilderness of the Osa Peninsula, one of the least developed corners of Costa Rica, combine to create an eco-lodge that is not only outstandingly beautiful but also totally off-the-grid. You won’t hear phones beeping at Laps Rios, but only the sounds of the forests and its rowdy monkeys and abundance of birds. Instead of spending time updating your Insta account, you can indulge in a relaxing spa treatment, take a refreshing dip in the gorgeous pool or an exhilarating hike through the pristine forest in search of sloths and macaws. Instagram can wait. 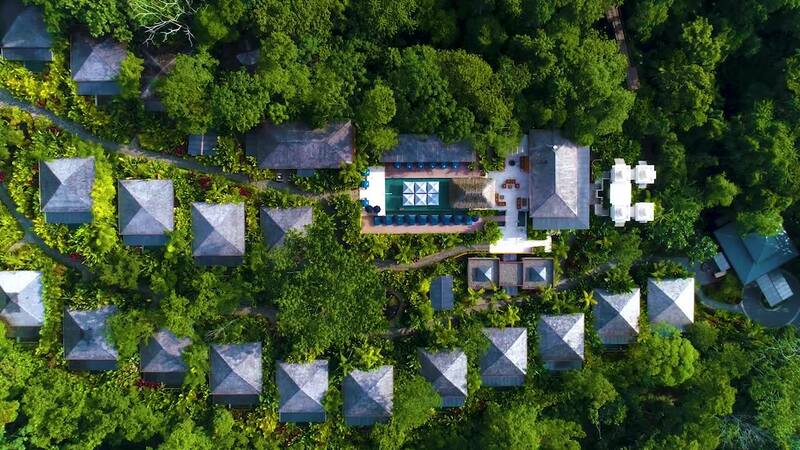 National Geographic named this one of the most unique hotels in the world and, besides unplugged blissfulness, what Lapa Rios offers is a truly magnificent and immersive rainforest experience. The resort stretches across 1000 acres of prime lowland forest, is beautifully designed and aimed at making you feel at one with the nature around you. There’s no air-con nor a Tv in the bungalows, no Wi-Fi connection nor phone reception, anywhere in the property. Instead, there are naturalist guides, wildlife-watching walks, stunning verandas, gourmet meals and special programmes specifically aimed at visiting families, honeymooning couples, adventure-seekers and those craving a restful reprieve. If this is what life is like without Wi-Fi, you may never look at your gadgets the same way again: this is unplugged Costa Rica at its very best. Nayara Springs is just a 3hr drive from San Jose in what is, essentially, one of the most developed and touristed areas in the country, just a few miles from famous Arenal Volcano. Yet the moment you enter this absolute haven of a place, it’ll feel like you’ve just stepped into another world. Nayara Springs has a pedigree befitting what will surely be your initial impressions – over the last decade, it’s been named the #1 spa resort in the world, #1 hotel in Latin America, one of the world’s most romantic hotel for honeymooners and, if that’s not enough, the #1 restaurant in Arenal. This kind of beauty, service and luxury doesn’t go unnoticed. Much like Lapa Rios, Nayara Springs sits on 1000 protected acres of prime rainforest, home to an abundance of wildlife and 17 stunning open-air bungalows with private viewing verandas, garden and plunge pool, a jaw-dropping communal pool with a view to kill and an array of activities and indulgences aimed to destress and revitalise. Yoga, wildlife-watching, sublime spa treatments, gourmet dining and, of course, Costa Rica’s most famous volcano national park just a step away. Nayara Spring snow proudly offers free high-speed Wi-Fi but here’s the thing: book a detox package and, after you agree to safely store your devices with the super professional staff, they’ll set you up with yoga and meditation classes, as well as a few excellent spa treatments. A wonderful win-win as far as we’re concerned. Do note that this is an adults-only lodge and one of our most popular choices in Arenal. If you’re craving more than a restful vacation but a comprehensive wellness experience that’ll work wonders on your body and soul then Asclepios is the place you should set your sights on. 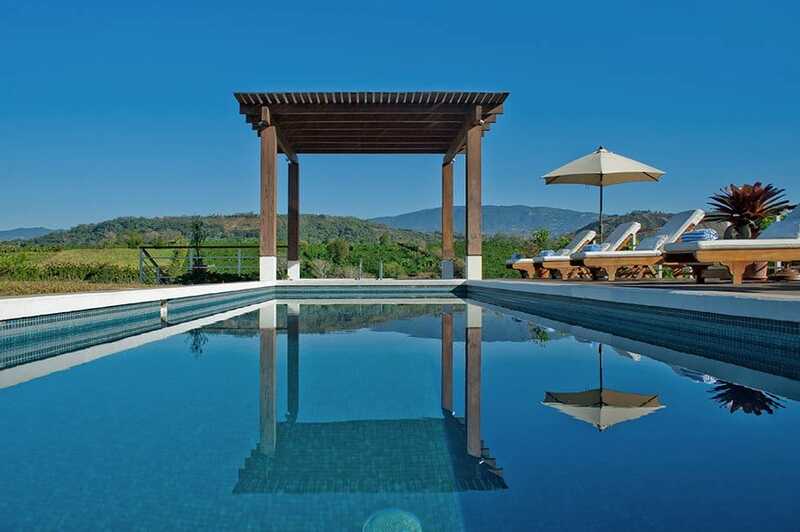 A fully-serviced wellness centre and health spa, Asclepios is that quiet retreat you seek when you really need to disconnect from everything, one that offers startling views across to the mountains and nearby coffee plantations. It’s only a half-hour’s drive north of the capital (easy to include two nights’ stay either at the start or end of your adventure vacation) and set in a superb location. Here, you’ll swap the AC, Wi-Fi and culinary over-indulgence for reflexology, meditation, Pilates, yoga, aquafit, Vichy showers, floral remedies, destressing spa treatments and organic meals aimed to detox and boost your metabolism and digestion. Food is sourced locally (think lots of fresh vegetables, fish and fruit) and complemented by healthy grains and homemade breads. If this sounds like a sacrifice rather than a bonus to you, Asclepios may not be suitable yet if a chance to unwind and detox is high on your agenda then consider this your Eden found. A unique concept lodge set in an exquisite property boasting a wildlife refuge, private dipping pools and waterfalls. 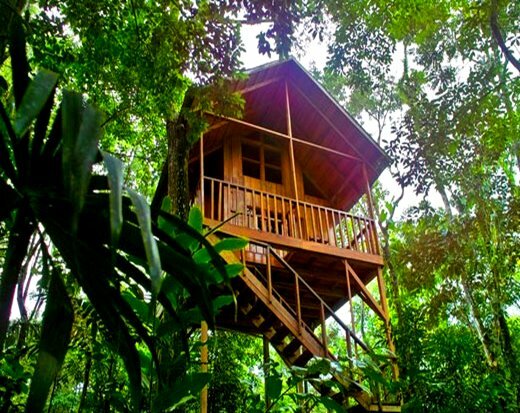 At Tree Houses, the rainforest is your literal home as you swap your standard hotel room for delightful tree houses the kids will simply adore. There’s a ton of stuff to do here that doesn’t involve Candy Crush, like bird-watching and wildlife walks (the complimentary night walks are simply awesome), hiking, swimming and, of course, the bustling highlights of Arenal nearby. Although we bet that once you arrive you will not want to leave this place! Food is delicious and the tree houses, rather surprisingly, are equipped with air-con for even greater comfort in the height of summer. In the morning, the gorgeous staff delivers coffee right up to your porch and sets out some fruits to attract the exotic birds that inhabit the forest. This is an eco-stay that’s worth its weight in gold and we think it’s one of the best accommodation choices for families. 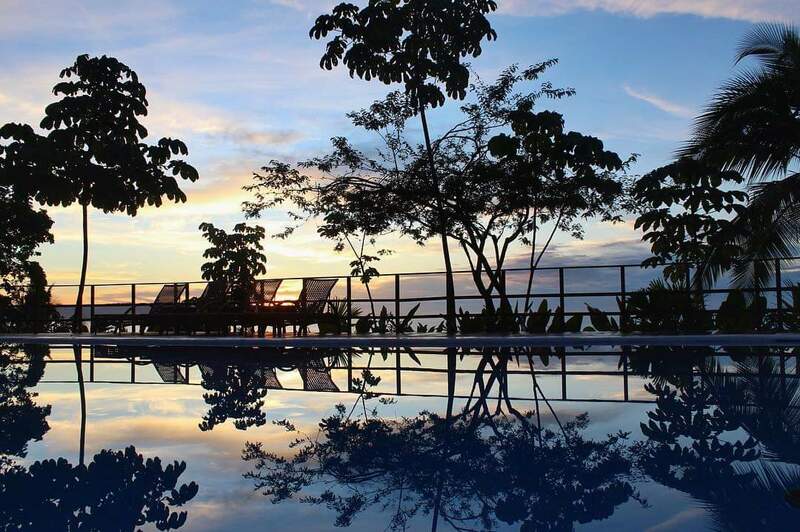 Whether you’re looking to unplug and get off-the-grid for two days or two weeks, you’ll find plenty of fantastic accommodation choices in Costa Rica. And when you leave Costa Rica Rios in charge of your adventure vacation itinerary here, you’ll know you’ll be in the best hands in the business. Let us connect and plan so all you have to do is head to wonderful Costa Rica and have the (unplugged) time of your life. See our collection of award-winning Adventure Vacations in Costa Rica and contact us to know more.